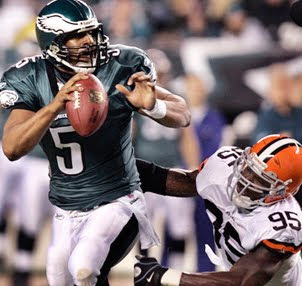 And A Player To Be Named Later: Is Donovan McNabb A Hall of Famer? However, if you asked the question, "Should McNabb be a Hall of Famer?" Well, that's up for debate. Let's took a look at the numbers, and compare them to some other quarterbacks. The best comparison might be Ken Anderson of the Bengals in the 70s and 80s. Anderson won an MVP award in 1981 and went to the Pro Bowl 4 times. McNabb has never won an MVP and has been to the Pro Bowl 5 times. Further, Anderson had a 59.3% completion rating and 3 times led the league in completion rating to McNabb's 59%, and McNabb has never led the league in completion rating. Anderson's Y/A and Y/C were 7.3 and 12.4 to McNabb's 6.7 and 11.7. McNabb leads large in interception rating with a 2.1 to 3.6 for Anderson. Anderson led the league QB rating 4 times, Y/G 2 times, and completions 2 times. McNabb has led the league once in Y/C and once in TD%. Anderson went to the Super Bowl once and lost, same for McNabb. All tallied up Anderson's QB rating 81.8 to McNabb's 86.5 for the regular season and Anderson's Super Bowl rating was a 95.2, McNabb's 75.4. Anderson is not in the Hall of Fame and never will be. Another QB with very similar ratings would be Mark Brunell. Brunell had a 59.5 completion rating. His Y/A and Y/C 6.9 and 11.6. His interception rating was a 2.3. He never made the Super Bowl, but did lead the expansion jaguars to the playoffs 4 times in their first 5 years, including 2 AFC Championship games. Like Anderson, Brunell is not in the Hall of Fame. Career Passes Completed Per Games, trailing Jon Kitna, Jason Campbell and Drew Bledsoe. What detractors of McNabb have always pointed out was McNabb's accuracy: The numbers bear that out to some extent. While McNabb is exceptional in not throwing interceptions, he is not an accurate passer, earning a 59.0 lifetime accuracy rating, directly behind Elvis Grbac. Aside from Grbac, Anderson and Brunell, McNabb also trails Brad Johnson (61.7), Mark Bulger (62.1) and Jeff Garcia (61.6). Garcia is an interesting case. 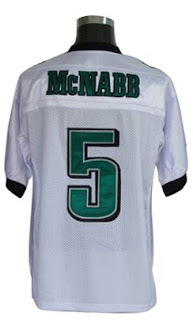 A contemporary of McNabb's, his number aren't much different than McNabb's. Garcia's quarterback rating is 87.5 to McNabb's 86.5. His TD percentage is 4.4 to McNabb's 4.6 and his Y/C is 11.3 to McNabb's 11.7. IN yards per attempt, both tied at 6.9. Garcia has a 2.3 interception rating while McNabb's is 2.1. Garcia went to the Pro Bowl 4 times to McNabb's 5. McNabb's defenders write that he never really had good wide receivers—only 2 Pro Bowler WRs in his career—Terrell Owens once and Kevin Curtis once. But what about 2006, when Jeff Garcia stepped in when McNabb went down with an injury. In 10 games, McNabb had a 57% completion rating and a 5-5 record. Garcia had a 61.7 completion rating and a 5-1 record, including 63 4th quarter points in those 6 games. McNabb had 55 in his starts. Now I think McNabb is the overall better quarterback, but is he that much better than Garcia? Look up Jeff Garcia and Hall of Fame on Google, and you get nothing. Look up McNabb and you get dozens of articles debating for or against McNabb's Hall of Fame worthiness (mostly for). Nobody thinks of Jeff Garcia as a Hall of Fame quarterback and they shouldn't. He was a very good quarterback when given half a chance to be (he played on some truly awful teams in Detroit and Cleveland). McNabb has played on some very good teams in Philadelphia and has played very well, but seemingly not well enough to get the Super Bowl ring. In the November 9th article from Ray Didinger, he points out exactly how difficult getting into the Hall of Fame is—even quoting that old axiom, "This isn’t the Hall of the Very Good. It’s the Hall of Fame." And that's exactly the argument against McNabb; he's been very good his whole career, but not great. Is the one of the definitive quarterbacks of his generation? No, that goes to Peyton Manning, Tom Brady, and Kurt Warner. Again, McNabb falls into that category of very good, but not great. But before anyone, even his coach, anoints him as a Hall of Famer, they should look at the bigger picture. Look at the quarterbacks who are in and look at the quarterbacks who aren’t in. Look at where the bar is set. It is higher than you might think.... (Again) Look at the quarterbacks who aren’t in: Phil Simms played 14 seasons with the New York Giants and was the Most Valuable Player in Super Bowl XXI; Joe Theismann led Washington to two Super Bowls and was league MVP in 1983; Jim Plunkett won two Super Bowls with Oakland; Ken Anderson played 16 seasons in Cincinnati and led the league in passing four times; Ken Stabler won a Super Bowl in Oakland and was league MVP in 1976. And Didinger goes on to say that none of these quarterbacks even made it to the Final 15 in Hall of Fame voting. "The road to Canton is steep, but it should be," he says. So should McNabb be in the Hall of Fame? Ultimately, it depends on what he does with the rest of his career. If he turned into fellow townmate Jamie Moyer and wins over half his games after the age of 34, then sure, he's in. However, if he doesn't win a Super Bowl and doesn't put up astonishing numbers, then the vote should be no to Donovan McNabb in the Hall of Fame. As Didinger writes: The Eagles have only "...one Hall of Fame quarterback in three quarters of a century. Donovan McNabb may make it two someday. Someday, but not yet." Cool that you bought up Ken Anderson, one of the most underrated QB of all time. He played in a small market and went to an obscure school (Augustana). Look at his stats vs. Namath. If Anderson played in NY he would have been a big deal. No, he is not a Hall of Famer. He did not come up big in the biggest games, and was puking in his very biggest game. His numbers aren't great for a West Coast QB either. Who's The Second Lefty In The Yankees Pen? Rotations: Which Is The Best?